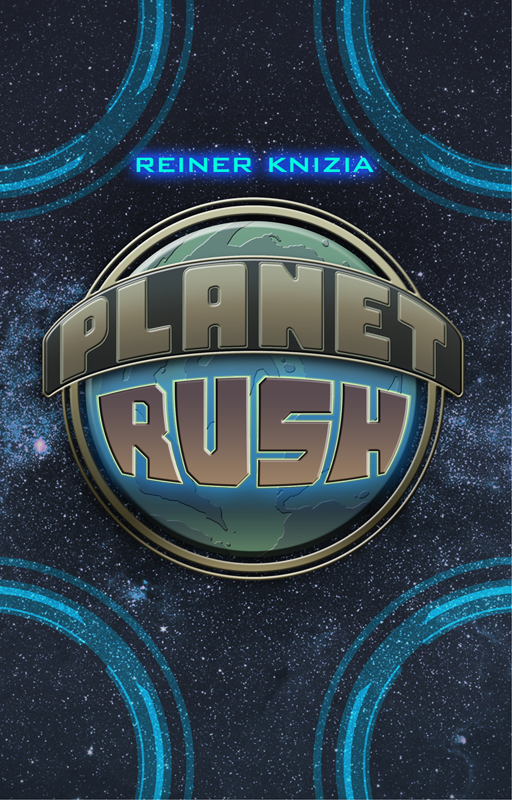 Planet Rush is a game by Reiner Knizia, published by Victory Point Games. It is for 3-5 players. In this game, players will take control of one of the 5 corporate factions that are working together to colonize the recently discovered Earth-like planet, Zenobia. They will have to team up to construct massive structures on the planet’s surface. The player that can construct the most will be declared the winner and will be able to claim ownership of the planet itself. To begin, the 8 structures should be placed in the middle of the play area with the “under construction” side face up. The bonus counters should be shuffled together. One counter is then placed face up on each segment of each structure. Each player chooses a faction mat and is given the corresponding colored markers for that faction. One of their markers is placed to the side of their mat to be used as a scoring marker. Players also receive their corresponding faction Negotiation card. Any remaining mats, markers and faction negotiation cards are returned to the box, not to be used. The resource cards are shuffled together. Each player is then dealt 4 cards each. The remaining cards are placed face down near the structure mats to form the Resource deck. The active player is chosen and they are given the Rocket Ship and Launch Pad counter. Play now begins. The game is played in a series of turns. Each player’s turn consists of 2 phases, a build phase and a resource phase. The first phase is the build phase. In this phase the active player may choose one of 2 different actions to complete. One action the player can choose to do is to draw a card from the Resource deck. This will give them a card advantage for later turns. If this action is chosen, play then proceeds to the Resource phase. The other action that may be chosen if for the active player to place the Rocket Ship on one of the segments of one of the 8 structures that has not been completed yet. The player then announces the building resource requirements. All of the other players may then select one or more of their cards to place face down in front of themself as a bid. Once all players are ready they will then reveal their bid simultaneously. Any cards that do not match the required resource type are returned to the player’s hand. If the player reveals a Faction Negotiation card without any accompanying resource card of the required type, this card is also returned to the player’s hand. The active player then looks at the remaining bids and chooses any bids they wish to use and rejects any bids that they chose not to use. Rejected bids are returned to the player’s hand. If the active player chooses to accept a bid without a Faction Negotiation card, the bidding player is then allowed to place a number of their colored markers onto the empty circles of the selected structure’s segment equal to the number of resource cards that were bid. If the active player chooses to accept a bid that has a Faction Negotiation card, the active player is then allowed to place a number of their colored markers onto the empty circles of the selected structure’s segment equal to the number of resource cards that was bid. The bidding player will then collect the bonus counter that was placed on that segment. The active player is not allowed to accept more than 1 bid that contains a faction negotiation card. It should be noted that the active player may choose not to use any bids and instead play cards of their own that match the segment’s required resource. They may then place their own markers equal to the cards played and also collect the bonus token for themself. One more thing of note, the active player is only allowed to approve bids if they succeed in raising the exact total number of resource cards required to complete the segment. No more, no less. Each bid must be accepted in full or not at all. Once this is completed, any resource cards that were used are discarded onto the discard pile. Faction Negotiation cards that were used are returned to the corresponding player’s hand. This takes us to the next phase. The next phase is the resource phase. In this phase, each player is dealt 1 new card from the Resource deck. The Rocket Ship and Launch Pad are then passed to the next player in turn order. That player now becomes the active player and a new turn starts. It should be noted that once a structure has been completed, it is then scored. All the markers on the structure are placed beside the structure tile and the tile is then flipped over to it’s completed side. Players then add up the markers to see who had the most. That player then places one of these markers next to the first place location on the tile and adds the indicated amount to their score, moving their scoring marker on their player mat. The player with the next highest amount places their marker on the 2nd place location on the tile. This continues until all players that contributed have placed one of their markers. Once this has been completed, players receive their used markers from the scored structure. The game continues until after the seventh structure has been scored. The eighth structure will not be scored. Players now receive bonus points for the number of different completed structures that they have markers on. Players compare their final scores and the one with the most points is the winner. This game comes with some really nice looking pieces. The tokens are thick and nice. They are pretty much the same quality style as games like Healthy Heart Hospital or Bountytown. Nothing absolutely spectacular but they get the job done and are pretty sturdy. The Faction mats and Structure Mats are really gorgeous. I absolutely love the artwork on these. The only bad thing is that the mats are a bit thin. It would have been nice to have had some thicker cardboard tiles and mats, but as long as you don’t manhandle the things, there shouldn’t be a problem. The resource and negotiation cards are really nice as well. I like the graphic design of these. The cards are just the right thickness and have a great finish on them. That’s good as you’ll be handling these a lot. The game also comes with some brightly colored wooden cubes to use as Faction markers. These are your average wooden cubes. They’re brightly painted and really good quality. There’s also a plastic stand that the rocket ship token is placed in to make it stand up. It’s a nice little touch to make the ship a little more visible on the table. Overall, I’m good with the pieces. I really like the artistic style and think everything looks pretty darn good. The rulebook for this game is nicely done. There several really great looking pictures in the book as well as a few examples. There’s a really nice setup picture that shows how everything should look. The rules are laid out really well and everything is easy to read and understand. The design is nice and it covers everything you need to know. The book isn’t that large so it won’t take very long to read through. The rules are quite simple so I don’t see anything that should give you any problems. Overall, I don’t really have anything to complain about here. This game is fairly simple. 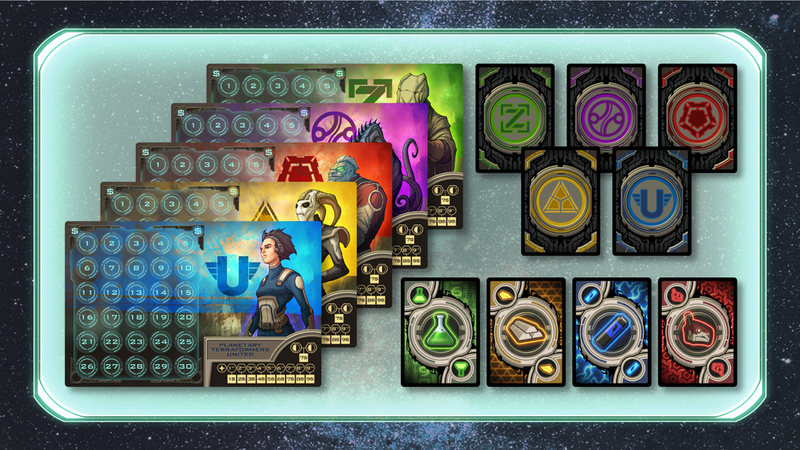 As a player you’ll be choosing to either add a card to your hand or construct a segment of one of the structures. Of course you’ll need to make sure that you’ve got a good selection of the matching resource to be able to score points. Getting those bonus counters are a pretty big thing and something that you’ll definitely want to keep in mind as you make the decision on which bids to accept. Basically this game is all about hand management, if you hadn’t already figured that out. Yes there is a bit of area control through the scoring of points for having the majority on a certain structure. However the main theme is strictly about controlling the cards in your hand. Yes, there’s a bit of the luck of the draw here, but you can overcome that by making good choices on how you bid when you’re not the active player and which segment of a structure you choose to build when you are the active player. For me the game is a nice, fun and simple card game. It’s not a really long game and it doesn’t take a ton of time to play, around 35-45 minutes. Pretty much if you’ve played any of Kizia’s games, then this won’t be much of a surprise for you as it tends to follow his style of gameplay. If you’re a Knizia fan then this game will be right up your alley. Fans of his games like Spectaculum or Tower of Babel should really enjoy this one. I’d also say that if you like a good hand management game then you’ll enjoy this one immensely. Overall, this is a pretty good game. I would recommend it, especially if you like Knizia. Planet Rush is a hand management game with a bit of area control mixed in. The game doesn’t take a really long time to play. Most game sessions last around 35-45 minutes. The artwork is really great especially on the Faction and Structure mats. I do wish that these were a bit thicker as they are a bit on the thin side. However as long as they’re not manhandled, they should hold up fairly well. The game itself is really well done. There’s a good bit of strategy on what to bid and which segments of a structure to build. However you should be aware that there’s also a fair amount of luck involved as well as you just never know what cards you’re going to get from the deck. Overall though the game is a great card game that highlights what Knizia does best, make really good games. For me the game is a great filler style game that can be played fairly quickly without a lot of setup. Fans of Knizia or hand management games should really enjoy this one. I would recommend it. It’s well worth checking out. For more information about this and other great games, please check out Victory Point Games at their site. This entry was posted in Reviews and tagged board, board games, card, card games, games, knizia, planet, planet rush, point, reiner, reiner knizia, rush, victory, victory point games. Bookmark the permalink.